Combine the Olive Oil, Lemon juice, Salt, Pepper, and Garlic in a small bowl or dish. Stir. Place Chicken in shallow marinating dish and turn and coat chicken with mixture. Further season the chicken by coating one side of each piece with poultry seasoning. Marinate for 45 mins in fridge, turning once Â½ way through. 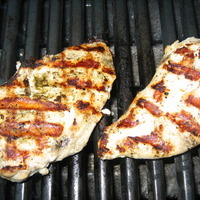 Grill chicken on outdoor BBQ grill on medium, or medium low to prevent flare-ups from the oil. You donât want to char to outside of the chicken. Made this for a dinner party at the beach. As advertised, really simple and really good. It was the one grill item that got cleaned out! Nicely done, Grillking. We grilled this tonight with skinless, boneless chicken thighs. They were awesome. Very flavorful. You definitely must be careful of the flames and monitor it while cooking. This looks amazing! I would love to make this up on my George Forman grill...then put the chicken in various recipes! This features recipes all over the world. I made this on my GF grill tonight. It was very delicious!